The global bike sharing leaders are forever tied at the hip, but how do the two companies differ? The article Mobike vs ofo: The race for the world’s bike rental market first appeared on Technode and was written by Masha Borak. It is almost two years since Mobike co-founder Hu Weiwei put around 50 bicycles on the streets of Shanghai and drove away. Ofo had a similar beginning, spreading out shared bikes on Beijing’s university campuses. This is how China’s dockless bike rental economy was born—from moves that could easily be branded as crazy. Today, bikes are so bountiful that they are literally blocking the streets of Chinese cities. Although both companies have been hesitant to release numbers, the latest iResearch’s data (in Chinese) show that Mobike has 8.65 million daily active users while for ofo that number climbs to 9.65 million. During 2017, Mobike has raised $1 billion and Ofo $1.15 billion, according to their own data. The meteoric rise of the bike rental market has drawn much attention, not just for its disruptive business model, but also because it is one of the first tech trends coming from China that has swept the entire world. The two bike rental giants have taken very different roads to success in China. Ofo took the fast route by quickly spreading cheap bikes from campuses to the streets of Chinese cities. It then worked on its technology with the help of investors China Telecom and Huawei by adding GPS tracking and upgrading its locks. Mobike was more meticulous in planning: the company first set up its own factory to produce sturdy bikes integrating GPS and QR code authentication and then moved on to expanding their business. Co-founder of ofo Austin Zhang (left) and co-founder of Mobike Weiwei Hu. 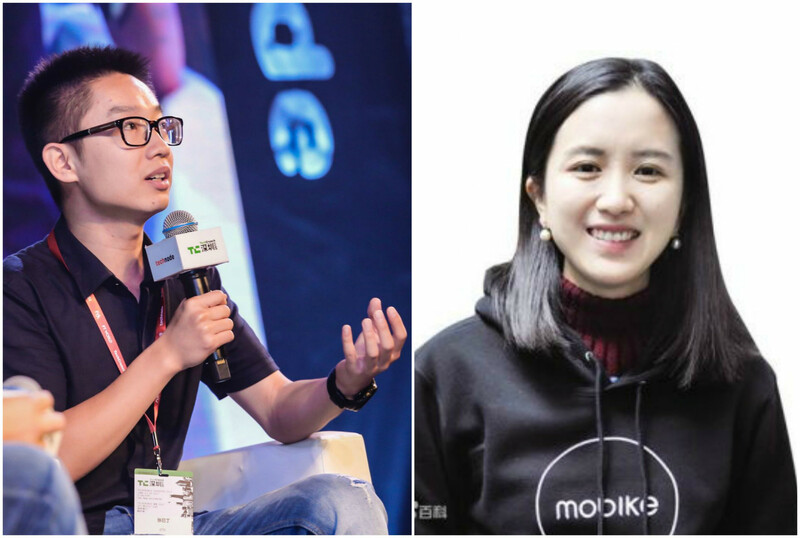 As Grace Gu, principal at one of ofo’s backer ZhenFund, explained during this year’s ChinaBang Awards, ofo showed a typical Northern China style of expansion, while Mobike has the Southern China business style. “In short, Southern style is bottom-up with a ready product, and Northern style is top-down strategy and later do optimization,” said Gu. The two companies have transplanted their styles into the global arena. 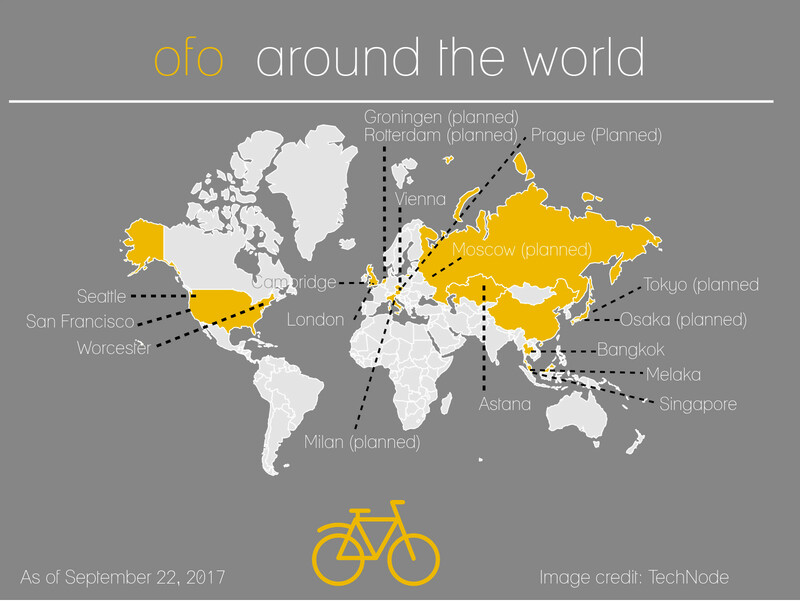 Ofo is following its co-founder’s Austin Zhang’s credo “rapid spread, yellow will cover the world” and has ambitious plans to cover 200 cities by the end of 2017. Half of that goal is already fulfilled, mostly in China. Besides Chinese cities, the little yellow bikes can currently be seen on the streets of UK, US, Singapore, Thailand, Austria, Malaysia, Kazakhstan, and Japan. On September 22nd World Car Free Day the company announced it will be launching in a cluster of four European countries of Russia, Czech Republic, Italy, and Netherlands. Ofo also went beyond the simple yet effective marketing tactic the two companies have been using in China. With their flashy colors, the bikes market themselves; all they had to do is offer free rides and the good word was spread by the users. Now, ofo is taking a more vocal approach: it has teamed up with UNPD to offer grants for green projects and has announced smog-filtering bicycles by the end of the year. It has even gotten Rihanna on board by sending bikes to schoolgirls in Malawi through the singer’s foundation. Mobike, on the other hand, has been behaving in the Southern Chinese fashion—slow and cautious. According to the company’s Head of Global Partnerships Florian Bohnert, the company is now focusing on raising their efficiency through technology and strong support from the local government. Mobike has set the same target as ofo for this year—200 cities. Besides China, the company has so far entered Singapore, US, UK, Italy, Japan, Thailand, and Malaysia. But Mobike has been compensating for its lack of speed by investing in AI data monitoring platform Magic Cube which will help operate its bikes and fight illegal parking. The company has also partnered up with tech giants such as Foxconn, Qualcomm, Vodafone, AT&T, Cisco, and Ericsson. “These partners help us in a number of different fields (chip intelligence, telecoms, IoT, and more) to always improve the service: more accurate location of the bike, more precise data research, more reliable components, etc. 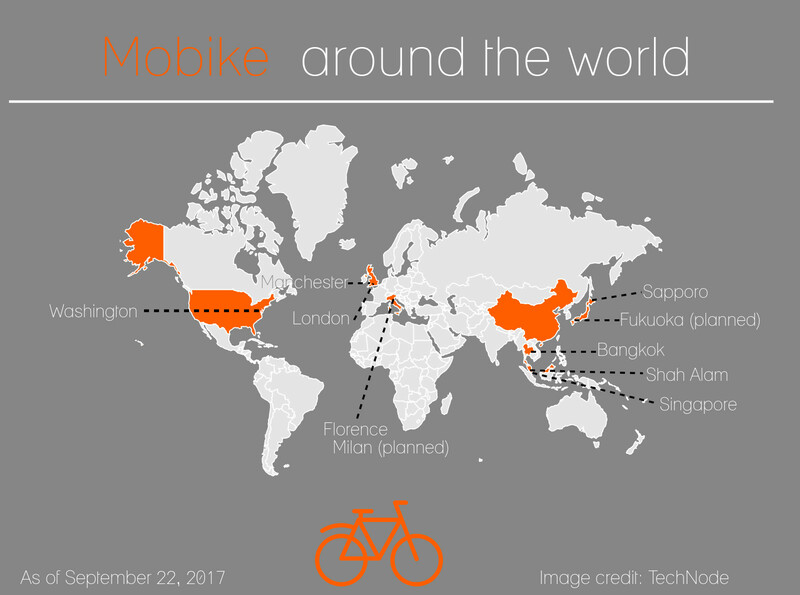 This plays in line with the fact that Mobike is at heart a technology company, unlike any of its peers,” said Bohnert. But ofo is catching up on the big data game. In Japan, ofo is cooperating with SoftBank C&S’s division for IOT, robotics and the cloud. It was also the first bike rental company to announce implementing near-field communication (NFC) locks which will enable users to unlock bikes even faster. The two companies have geared up to fight for the global market, but the road ahead will be slippery. As Brian Chaitoff from research company 7Park Data explained in an earlier interview with TechNode, bike rental will face unique growth dynamics in different markets. “The success of expansion into other markets will be in part based on these factors–including population density (i.e., high capacity utilization and high availability), economic factors, conducive environments for safe biking (i.e., physical layouts, base rates of crime, etc. ), and state/government regulations that do not hinder growth,” Chaitoff said. One of the bigger issues is gaining the trust of local governments. Bluegogo’s examplereminds us that not all cities are willing to take the risk of flooding its streets with shared bikes. The company shipped hundreds of bikes to San Francisco just to have the government issue regulations that would make it unfeasible to operate in the city. Even when the cities agree to welcome shared bikes, there are other factors to consider—factors that make us think “This is why we can’t have nice things.” Many still recall the notorious case of Paris docked bike-sharing scheme Vélib which reported half of its bikes were stolen, some of them being discovered as far away as Romania. And while vandalism and theft are not rare in China, bike sharing companies in foreign markets will be left without the possibility of quickly replacing stolen and damaged bikes. Finally, both ofo and Mobike will have to face local competition. US companies are joining the race: LimeBike already coverS eight cities, Spin is taking on ofo in Seattle, while Vbike is starting is growth in Dallas. Even regulation-obsessed Europe has welcomed its first homegrown dockless bike rental scheme Urbo. Recent news from Singapore—both Mobike’s and ofo’s first foothold abroad—has shown that the Chinese bike rental giants could lose out: local company oBike is currently the most popular bike renting option and it is making its way to London. The article Mobike vs ofo: The race for the world’s bike rental market first appeared on Technode.